The government has postponed the last date of bidding for oil and gas blocks offered under the latest round of New Exploration Licensing Policy (NELP) to April 25, even as industry cried foul at finance minister P. Chidambaram’s proposal to end tax holidays for the sector. Punjab, Haryana, Himachal and Jammu and Kashmir have once again been denied the benefit of the tax holiday scheme floated by the union government. Smarting under a notional loss of about Rs 100 crore in the wake of legal battle with Bajaj Auto over the double spark plug engine controversy in the 125 cc motorcycle ‘Flame’, TVS Motor Company today relaunched the bike in a new avatar. The UK today assured that there would be no discrimination against Indian professionals for work visas in Britain. Thomas Cook Group has made an open offer to the shareholders of Thomas Cook (India) for acquiring 20 per cent stake in the domestic travel firm for about Rs 351 crore. Even as the stock markets sink and uncertainty looms large over where the world markets will go, there is lots of action taking place in the mergers and acquisitions (M&A) space. India and Japan can double their bilateral trade to $ 15 billion by 2010, according to a study conducted by the Confederation of Indian Industry (CII). Rough ride for the Indian automobile industry continued with the overall vehicle sales declining by 10.34 per cent in February, mainly on account of falling motorcycle sales, down by 17.68 per cent. The All India Reserve Bank Employees' Association (AIRBEA) today called off the one-day countrywide strike in RBI offices on March 12 following talks with the bank management. Rallison Electricals, with a current turnover of Rs 350 crore, aims to cross the figure of Rs 1,000 crore by 2010 due to an immense growth in the power generation sector in the coming years. Customers can now make balance inquiries at ATMs for free and will be levied a maximum fee of Rs 20 per transaction for withdrawals, that too till March next year after which such usage would be not be charged. This would be irrespective of the amount and the bank where the customer holds the account. Moradabad’s peppermint industry losing flavour. The last date for bidding for 57 areas offered under the seventh round of NELP has been changed from April 11 to April 25, said S. Sundareshan, additional secretary, ministry of petroleum and natural gas, at a CII event here today. But Chidambaram’s Budget proposal to end seven-year tax holiday for production of petroleum (oil) and natural gas may prove to be a dampener to the government’s efforts to attract at least $4 billion investment in oil and gas exploration. E&P companies, particularly foreign players, said the proposal would be a dampener and impact investor sentiments as seven-year tax holiday has been the salient feature of all NELP bid rounds, including the latest one. "It (end of tax holidays) won’t stop us from bidding but it will change the way we will be bidding," BP exploration director (South Asia) Jonathan Evans said. Sundareshan said the ministry of petroleum and natural gas has taken up the issue with the finance ministry as the new proposal was contrary to the fiscal regime promised in NELP rounds. Niko Resources’ vice-president Larry Fisher said the move would change the way companies construct their bid. Sudhir Mittoo, India representative of Petrobras of Brazil, said the change in tax holidays was a worrying factor. Companies bidding for the 29 onland, 19 deep sea and 9 shallow water blocks of NELP-VII will account for longer period for investment recovery in absence of the tax incentive, thus, offering lesser share of production to the government. Fisher said rules of the game could not be changed midway, referring to seven-year tax holiday forming integral part of the previous as well as current NELP bid round. The bid dates for NELP-VII have been postponed because of change in schedule for promotional road shows, said Anil Jain, joint secretary (exploration) in the petroleum ministry. "The road show in Singapore will now be held on March 28, and the one in Perth on March 31. This leaves very little time for companies to evaluate data and take a bid so the bid closing date has been postponed," he said. Punjab, Haryana, Himachal and Jammu and Kashmir have once again been denied the benefit of the tax holiday scheme floated by the union government. The scheme could have given a boost to the tourism and hotel industry in the region. In the Budget presented by the union finance minister recently, five-year tax holiday has been extended to hotels located in specified district having a world heritage site. In a move, intended at promoting tourism, it has been proposed that tax benefits under Section 80-D of the Income Tax Act, will be extended to new two, three and four-star category hotels coming up in specified districts having world heritage sites for a period of five years. The districts which have been accorded tax benefit under the scheme include Agra in UP, Jalgaon and Aurangabad in Maharashtra, Kancheepuram in Tamil Nadu, Puri in Orissa, Bharatpur in Rajasthan, Chhatarpur, Bhopal and Raisen in Madhya Pradesh, Thanjapur and Nilgiri in Tamil Nadu, Bellary in Karnataka, South 24 Parganas and Darjeeling in West Bengal, Chamoli in Uttarakhand, Gaya in Bihar, Panchmahal in Gujarat, Kamrup, Goalpura and Nagaon in Assam, north and south Goa in Goa. The benefit will be extended to those hotels which start functioning between April 1, 2008 to March 31, 2013. Interestingly, none of the districts from Punjab, Haryana, Himachal or Jammu and Kashmir has been listed for tax benefit under the scheme. A group of lawyers, businessmen and political leaders led by Ashok Manocha has urged the union government to extend the benefit to the region also. They alleged that in Punjab, the Golden Temple at Amritsar is a world heritage site. In Ropar district Anandpur Sahib is the birth place of Khalsa. Ropar also has excavation of the Harappan era that is one of the oldest civilisations. The union government should have extended the benefit of tax holiday to atleast Amritsar and Ropar to promote hotel and tourism industry here. Bharatpur in Rajasthan has been granted the tax holiday just because it has international wetland area. Ropar district also has an international wetland area at Ropar and national wetland area at Nangal. Under what criteria has the district been left out. Darjeeling in West Bengal has been accorded the tax benefit, however, similar hill stations in Himachal as Dalhouise, Dharamsala and Palmapur have been denied the same. By denying the benefits to region the union government had once displayed its apathy to the region, they argued. Launching the motorcycle here today, TVS chairman Venu Srinivasan termed it as the ‘hottest biking experience in India’. The bike is fitted with a single spark ignition engine based on Controlled Combustion Variable Timing Intelligent (CC-VTi) technology, developed and patented by Austria-based AVL and licensed to TVS in India. Meanwhile, Srinivasan also announced to double the capacity at its Nalagarh (Himachal Pradesh) plant from the current 10,000 units per annum. Launched last year, double spark plug engine in the motorcycle had sparked off a tug-of-war between TVS and Bajaj, with the latter claiming that the company (TVS) was using its ‘patented’ technology. The matter later ended in the Madras High Court, forcing TVS to halt production and incur heavy losses. Fielding a volley of questions on the TVS-Bajaj imbroglio, Srinivisan maintained that the double engine technology had been in use for a long time by auto giants, including Honda and Ducati, and it was in no way Bajaj’s patented technology. “However, we will continue to fight the legal battle as a matter of principle,” he quipped. He claimed that over 600 bikes rolled out by the company last year would be converted into the single spark plug technology and ‘replaced’ to the dealers. With an ex-showroom price of Rs 46,000 and a mileage ranging from 60 to 65 km per litre, the company is targeting the youth. H.S. Goindi, senior vice-president, said the bike would also be available in major third world countries in Asia and Latin America by next month. An assurance to this effect came from Prince Andrew Albert Christian Edward, Duke of York and special representative of the Department of Trade and Investment, when he called on union minister of state for industry Ashwani Kumar here. Kumar had expressed concern that the recent point-based system for work visa to non-EU specialist could be discriminatory to Indian professionals seeking work visas in the UK. While expressing satisfaction on the current level of mutual engagements, particularly by MNCs of the UK in India and Indian MNCs in the UK, the two leaders noted there was tremendous scope for an exponential growth not only in trade but also in investments. 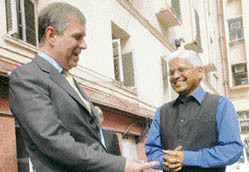 Duke of York said British companies recognised that India would be at the centre of the Asian economic growth story. He informed Kumar that British companies were aware of the importance of India’s favourable demographic profile being the major contributor of the growth of global economy. The visit of Duke of York came right after the annual summit visit by Prime Minister Gordon Brown to New Delhi in January assumes special significance in respect of trade and investment relations. The UK is the third largest investor in India with a cumulative FDI of $4.13 billion. At the same time, Indian investment in the UK in the year 2006-07 in 76 projects generated 1,450 jobs making India as one of the major investors. The total investment in these projects was about £1 billion. Indian companies have also discovered opportunities in the London Stock Exchange to raise their international profile. Thomas Cook UK has made an offer to acquire 32,795,996 equity shares representing around 20.4 per cent of the current voting capital of Thomas Cook India Ltd (TCIL) for Rs 107 per share, TCIL said. The offer would open on April 22 and would close on May 12, it added. Earlier on March 7, TCIL had said the UK-based firm would acquire a majority stake in Thomas Cook India and would also repurchase its Egypt business and brand licences in 15 West Asian countries from Dubai Financial Group (DFG) for a total consideration of up to 249 million euros (over Rs 1,555 crore). The total number of M&A deals announced in February 2008 stood at 36 with a total announced value of $2.95 billion. The most significant deal was the merger of two financial entities HDFC Bank and Centurion Bank of Punjab (CBoP), global consultancy firm Grant Thornton said. Private sector lender HDFC Bank’s merger with CBoP has driven India Inc’s merger and acquisition deal volumes to $2.9 billion in February this year. The other most significant deal was the acquisition of 17.2 per cent stake by Walt Disney Company in UTV Software Communication for consolidating its stake to 32.10 per cent in the domestic media company. It is interesting to note that there were 102 M&A deals with a total value of about $36.8 billion in January and February 2007. M&A volumes surged to record levels as two significant deals - Tata Steel’s acquisition of Corus valued at $13.6 billion and Hindalco’s acquisition of Novelis valued at $6 billion - were announced in that period. This year in January, the total number of M&A deals that were announced stood at 56, with a total announced value of $3.01 billion. In M&A space this year, cross-border deals continue to outnumber domestic transactions. While there were 17 domestic deals in February 2008, wherein both acquirer and target companies were Indian with an announced value of $2.47 billion, there were 19 cross-border deals with an announced value of $0.47 billion, Grant Thornton added. Two key areas can help achieve this figure: agricultural exports from India to Japan as the latter's self-sufficiency rate in food production is about 40 per cent; and export of high technology items from Japan to India provided New Delhi agrees to give end-user certificate to Tokyo. The latter point is sensitive and the United States, too, raised this demand at the Indo-US High Technology Cooperation Group that met here recently. The developed world is insistent on end-user certificate, as most of the high technology has dual use potential and can be put to military use as well. On the issue of agricultural exports from India to Japan, the study says that the share of agricultural items in India's exports to Japan had seen a decline by about 22 per cent in the past 10 years. The processed food exports increased by 4 per cent during this period. The CII also recommended addressing issues such as existence of certain non-tariff barriers for several Indian agricultural, pharmaceutical and chemical goods. On the Investment front, CII expects greater investment flows from Japan once the Comprehensive Economic Partnership Agreement (CEPA) is operational. On high technology goods trade, it said while these goods are sensitive from the security perspective, it should not become the basis for denial of these goods to genuine Indian buyers. India-Japan CEPA negotiations started in January 2007 and five rounds of negotiations have taken place till now. The next Round will take place in Tokyo later this month. The bilateral trade has more than doubled since 2002-03 and currently stands at close to $7.5 billion (2006-07) with the trade balance in favour of Japan. According to figures released by the Society of Indian Automobile Manufacturers (SIAM), the domestic passenger car sales managed a growth of 2.31 per cent in February. Total domestic vehicles sale in February stood at 7,42,027 units, against 8,27,594 units in the same month last year. The passenger car segment, which had managed to beat the high interest rates blues so far, clocked a marginal improvement at 94,756 units during the month, against 92,618 units in the same month a year ago, SIAM said. Segment leader Maruti Suzuki India registered an increase of 2.16 per cent at 51,762 units, against 50,666 units in the same month in 2007. Hyundai Motors sold 14,591 units during the month, against 15,432 units last year, down by 5.45 per cent. Tata Motors also registered a decline of 16.02 per cent at 13,451 units, against 16,016 units in the same month previous year. General Motors, however, had a near three-fold jump in sales with its hatchback ‘Spark’ continuing a good run. The company’s overall sales stood at 3,691 units, compared to 1,286 units last year. Industry experts attributed the drop in car sales to postponing of purchases by customers in expectation of excise duty cut in the Budget. On the motorcycles front, the slump continued with the segment registering a fall of 17.68 per cent at 4,25,089 units, against 5,16,410 units a year ago, SIAM said. “As far as power generation is concerned, our capacity will increase than the total power generated in the past 60 years. This would definitely bring immense growth in the demand of low tension (LT) and high tension (HT) wires,” said Lalit Babbar, manager director of the company, while launching the company’s products in Punjab. To achieve the target of turnover of Rs 1,000 crore by 2010, the company is setting up its new manufacturing unit in Chobanki near Bhiwadi in Rajasthan, he revealed. “By January, production of LT and HT wires will start in the new unit,” he added. Aiming to make all ATM usage free from April next year, the Reserve Bank today said the banks could not charge for balance enquiries and capped the fee for cash withdrawals at Rs 20 per transaction, irrespective of the amount and the bank where the customer holds the account. In a circular issued to all commercials banks, the RBI also said the customers would not be charged for even cash withdrawals at other bank ATMs with effect from April 1, 2009. It said the banks could not charge its own customers for any ATM usage, with immediate effect, while they would have to cut down cash withdrawal charges for other bank customers to a maximum of Rs 20 per transaction by March 31 this year. It has also asked the banks to make free with immediate effect the use of other bank ATMs for balance enquiries. About cash withdrawals, the RBI said no bank should hike the charges prevailing as on December 23, 2007, and those charging more "shall reduce the charges to a maximum of Rs 20 per transaction by March 31, 2008." The RBI has clarified that for two services — use of own ATMs for any purpose and use of other bank ATMs for balance enquiries — "the customers will not be levied any charge under any other head and the service will be totally free."